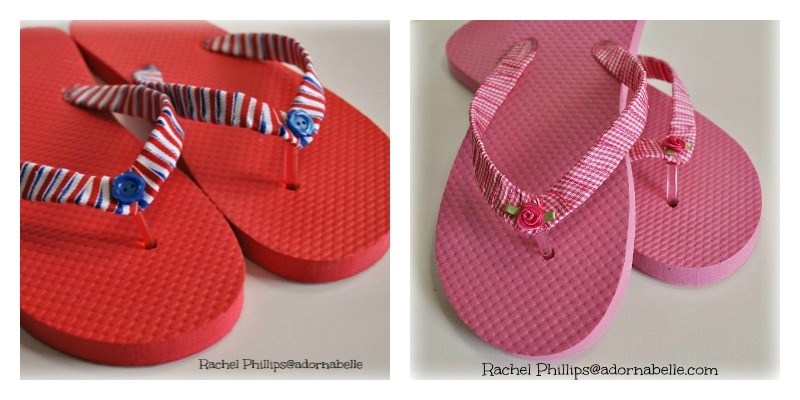 Guest tutorial by Rachel P.
Who doesn’t love flip flops? These are so simple to make! In a matter of minutes, you can have yourself a cute, new pair of footwear and they are perfect for the girl-on-a-budget! 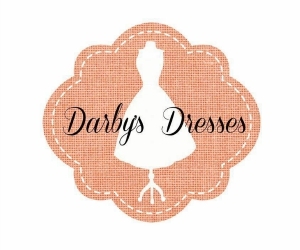 It’s an easy way to spruce up your wardrobe and they make excellent gifts as well. Let’s get started! Note: I bought all my supplies on sale for a total that was less than $5. Depending on when you buy your supplies and the materials you choose these prices may change, but these can be super reasonable to make. Especially if you can use a store coupon, too! 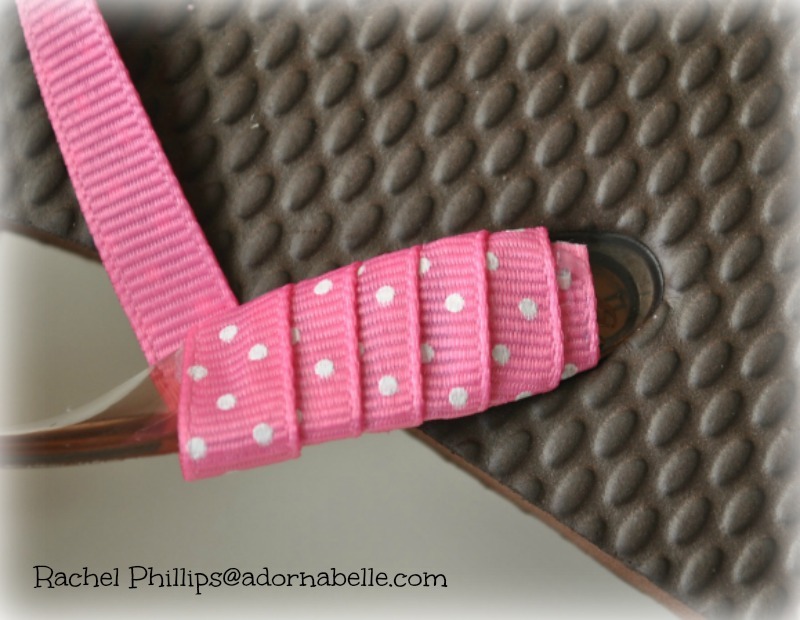 Next, dab a small bit of hot glue on one side of the flip flop strap. Try to get as close to the sole as possible. Press end of the ribbon onto glue quickly before the glue has time to dry. Wrap ribbon underneath the strap, and pull it back up and around. Dab another bit of glue right on top of the ribbon on the flip flop. Be careful not to use too much, as you don’t want it to ooze out! Press the ribbon into the glue carefully with your fingers, overlapping it slightly as shown below. You will only need to glue on one side each time to hold it in place. This is what it will look like after you’ve wrapped it around a few times. 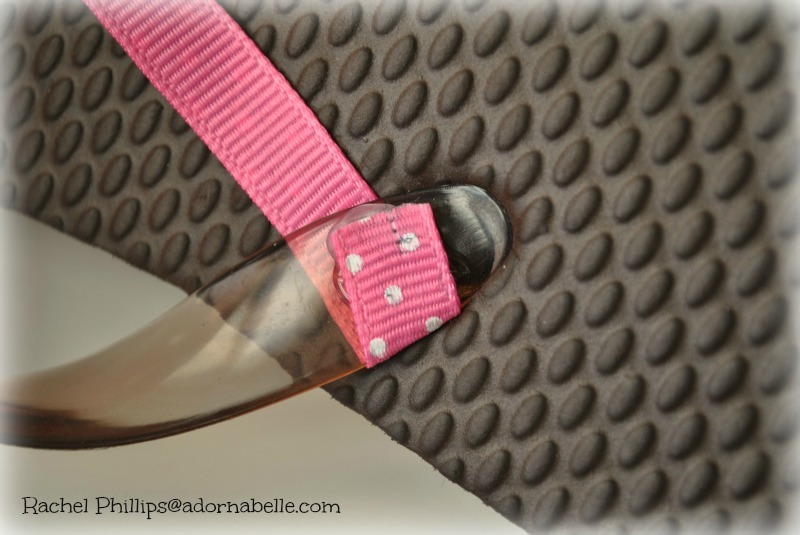 Continue to wrap and glue the ribbon into place until you reach the middle of the strap, as seen below. 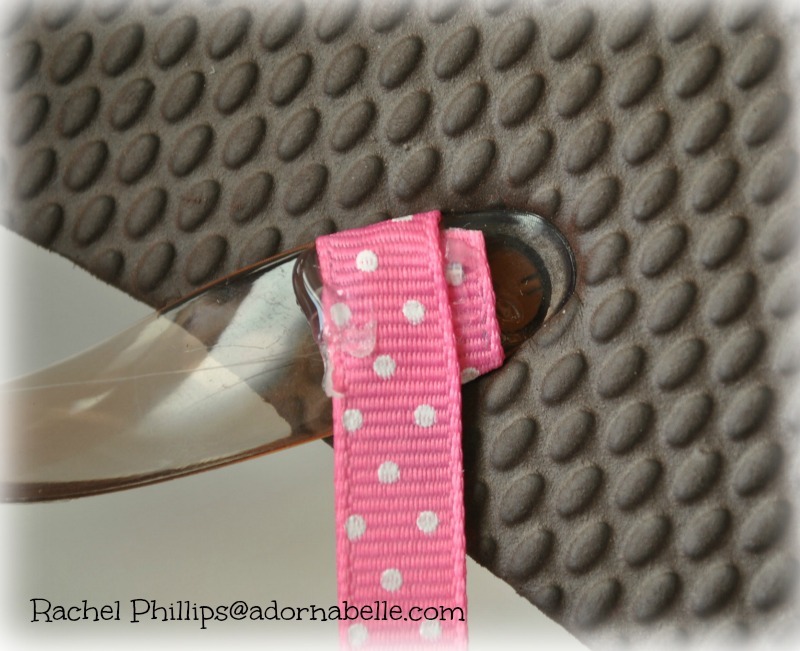 Carefully line the ribbon up directly next to the toe piece. Make sure it lies flat and doesn’t bunch up or it will become uncomfortable. Glue in place. Fold the ribbon around the back and overlap across the ribbon on the opposite half of the strap (as shown). Glue in place. Try to cover that area nicely so there are no gaps of plastic as best as you can! We’ll add a cute bow (or you can add a decoration of your choice!) later to help cover any minor imperfections. Continue to wrap the ribbon around on the unfinished side the same way you did on the first side, gluing as you go. When you have reached the end, snip the ribbon with the scissors. Use fray check or carefully melt the cut edge a little bit again. Glue the end in place (excess glue can be pealed away). 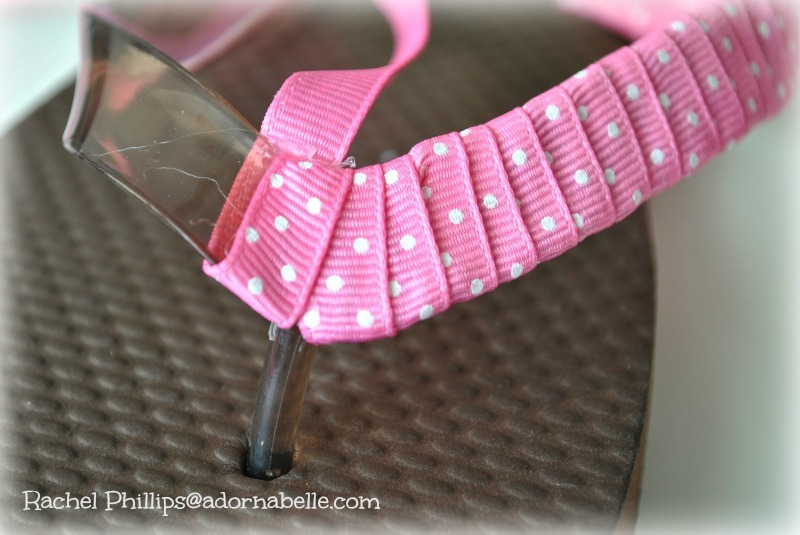 Try on your new flip-flops and make sure that there are no glue pricks or bumps. If it pricks or feels lumpy in a spot, you can peel that part away if necessary and try again. With the leftover ribbon, make two little bows. 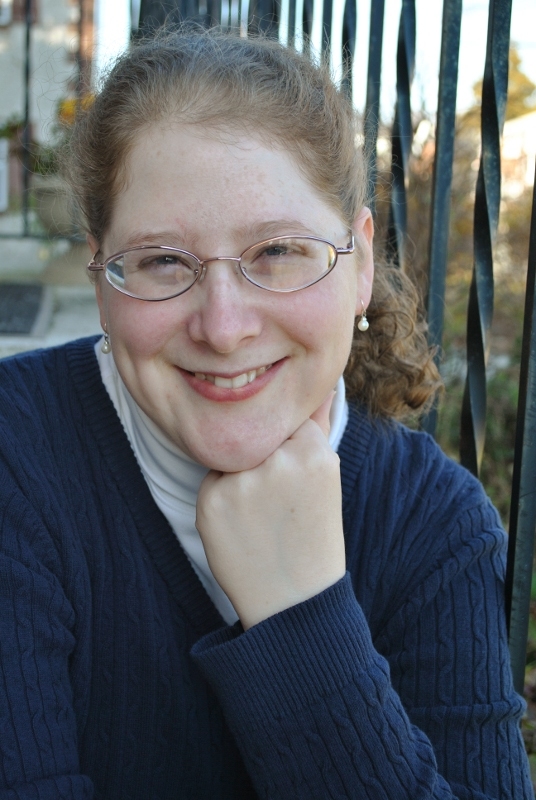 Once again, use fray check or melt the edges a little when you have the look you want. 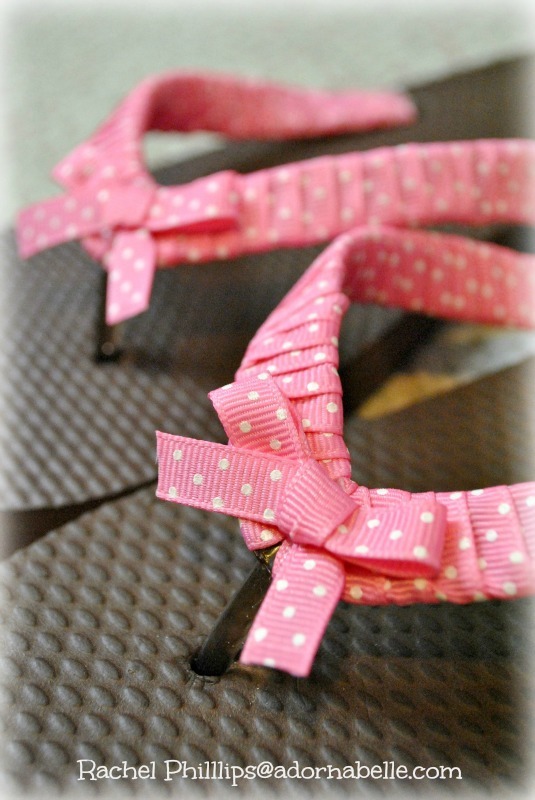 Dab a bit of glue onto the middle of each bow and press it onto the very middle of the flip flop strap. 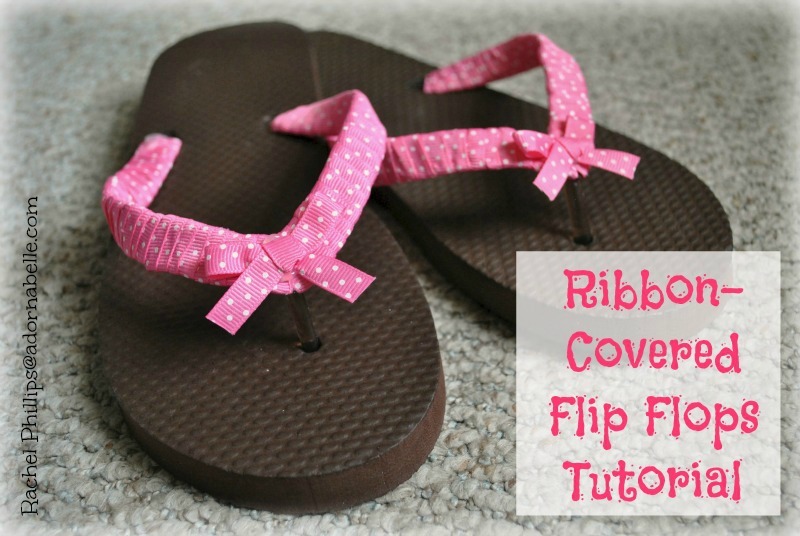 Follow the steps above to finish the second flip flop. Now you can wear your brand new and made by you flip flops with pride! Aren’t they cute? Use your imagination to create your own unique, cute style! Use different kinds and colors of ribbon to make a variety of bases, and add your own decoration. You could use any embellishments you’d like instead of the bows: rhinestones, a small applique, beads, buttons, seashells. 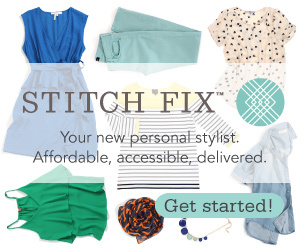 Make it your own and have fun creating! Great easy craft idea for my little girl’s birthday party! 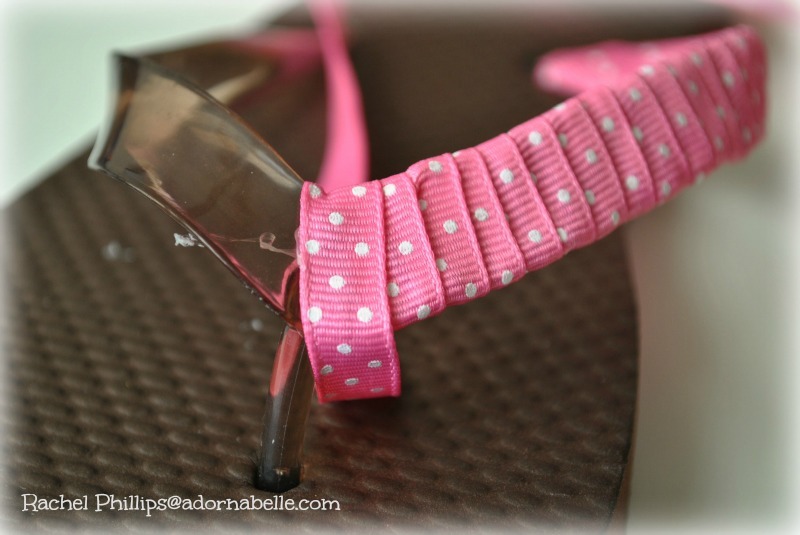 Did you use an entire 10 yard spool of ribbon for one pair of flip flops? These make really nice gifts. 🙂 I hope you enjoy crafting some for your friend Elizabeth!